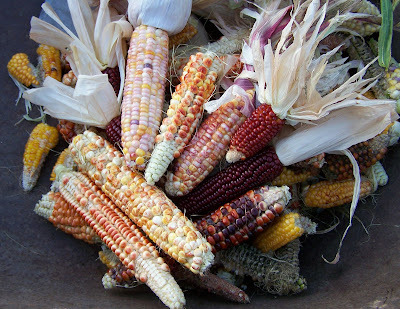 Corn from The Learning Garden shows remarkable genetic variation from one planting. This genetic variation not only looks cool, but could provide the basis for important new corn varieties that might be needed in the coming global-climate-change decades. We cannot risk ruining the living material that makes these colorful kernels. In 2004, I took a trip to Kansas to Wes Jackson's Land Institute, a science based program to create perennial food crops that can grow and not harm the prairie's of the mid-West that modern farming has decimated (together lets all say 'dust bowl' read Timothy Egen's book, The Worst Hard Time for a vivid – and chilling – description of that decade long phenomena). The keynote speaker that year was the award-winning journalist Michael Pollan whose books I have reviewed, recommended and loved. And while I knew Wes Jackson (Becoming Native To This Place, a marvelous book that shaped me profoundly in the early 1990's) and others, one man was an unknown. When I begin to describe Percy Schmeiser, tears well up in my eyes because no man in the civilized world should have to live the hell he lived, losing his farm and his livelihood in Monsanto's race to becoming Forbes magazine's 'company of the year' in a recent issue. I have often thought that Monsanto was cunningly astute in working with wind pollinated plants. They could contaminate much larger areas with their technology and, after the fact, announce that it was now impossible to retract the genie, “oh oops... look what we did!” Of course, the genie is not retractable and that is precisely why this is UNPROVEN technology. The twenty year trial to see what will really happen on down the road is happening now; in our stomachs, in our fields, on our children's immune systems and in the ecology of the entire planet. Never before (like the patenting of life itself), has the world been provided with such forbidding possibility of a disaster wrecking so many different facets of our lives. Monsanto's genetically modified corn was found in the wilds of Mexico. Monsanto hadn't planted it there – how did it get there? And worse, how much of that rich genetic material that is the heritage of all people who love corn was contaminated? What is the effect of rampant genetically modified pollen in the wild environment? What will happen (over generations) to the corn races of Mexico, the birth place of corn and home to the widest variation of wild genetic 'bloodlines' of corn from which we might need to draw in a future world facing global climate change or other disasters that are just bad 'business decisions' today? What if this technology eventually is proven to kill off all the butterflies? Or the bees? Remember that it took over two decades to understand that DDT was killing off the eagle and other birds. What if this technology is the cause of immune system problems that take more time to understand? We won't know this until it's too late and Monsanto's directors have made a killing (would that be a 'too-appropriate' word?) in profits by ruining lives, ecologies and societies? “Most of the food we eat that contains corn or soy was sprayed with glyphosate herbicide, and we’re being exposed to higher and higher levels of residue. In response to petitions from Monsanto, the EPA has approved up to 20-fold increases in the legal residue limits for food crops.” So, you are eating this stuff every day – a lot more if you are eating processed foods, eating in chain restaurants (goodbye Norm's...), fast food or your school cafeteria. Read the article. Now this might be just the beginning of a lot more disturbing news. Or it might not. But why were we allowed to be the test population for Monsanto's inventions? Monsanto and big Pharma work with the same business model as Union Carbide (remember Bhopal? ): Make us the money now because we'll be bankrupt when it's time to clean up our mess. It is tiring to have to face off with people who have the ethics of a rabid dog constantly. But will we just wring our hands and mutter to ourselves? In my earlier post, I listed companies that are Seminis seed dealers – Seminis is the name of Monsanto's seed business – and I asked everyone to not buy from those companies. Off line I was given a little flack because companies like Johnnies Selected Seeds really does sell a lot of seeds and it can be hard to get some of the old hybrids many of us have come to love (not on my lists of favorites, but F1 hybrids that many home gardeners love, like Big Boy or Early Girl tomatoes) because Seminis has bought up the companies holding the rights to those hybrids. I contend that giving ANY money to Monsanto feeds the giant and is only one of our few tools available to us. It would be symbolic, but I have thought that the County of Los Angeles should follow Mendocino County in outlawing the growing of gentically modified organisms. Unfortunately, we have lives to live and I think the most radical thing of all is to grow our own and opt out of the poison-as- solution mentality that has ruined American farmland in these last fifty years. Last note, because it will come up: We do NOT need Monsanto and it's technology to feed the world. That is a lie and has always been a lie. We do not need Roundup just like we did not need the so-called Green Revolution to feed the world. If this were true, the United States would not have over 10 million hungry people as estimated by a new study from Cornell University and the National Center for Health Statistics (NCHS) of the Centers for Disease Control and Prevention. Great article! Thank you for putting this information into such a compelling piece. I will be passing this on. Look over beautifulfoodgarden.com too - sometimes I don't get things posted on both that should be. Any specific questions on LA Gardening, let me know!! 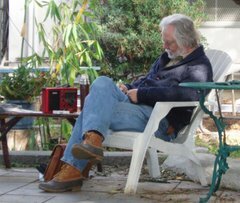 lagardenblog.com - David King, Author, Instructor - you can hire me as a speaker! Or just buy my book, when I finally get it published. © 2010 thru 2019, David King Please do not make copies of any material, text or photographs, on this page without written consent. This is my 'tip jar' - If you find something of value here, consider dropping a buck or two to encourage more good stuff in the future! Thank you! First Time Offering: The SPRING Urban Food Production UCLA Extension Class! good deal on a garden class!